If hill stations call you, it is time to plan a trip to Mussoorie. Mussoorie is a hill station in the Dehradun District of Uttarakhand state. Situated in the Garwhal region of Uttarakhand, it has an average altitude of 1,880m.The city was established in the year 1820 by a British Army officer. It is also referred to as the "Queen of the Hills". The name of the hill station has been derived from the grassland ‘Mansur’ where shepherds took their sheep to graze. It was only in 1823 when Mussoorie emerged as the hill station. on Cleartrip. There are different types of hotels available to suit your needs. 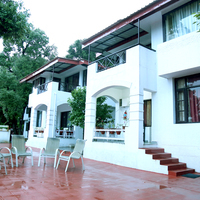 There are hilltop luxurious hotels to make your stay comfortable. If you are looking for budget hotels, they are also readily available. Such hotels have all basic facilities like TV, room service, and neat interiors. 5-star or 4-star hotels are also available with high-end services like spa, gym, and more. There are also guest houses, holiday homes, dormitories, etc. where you can find comfort at a cheap rate. Homestays are also a good option. - This should be considered while booking hotels. You must book hotels in city centre or near the top tourist attractions. - If you are planning to visit during peak season, you should book a hotel from Cleartrip in advance. - You can get hotels of every type. If you have a limited budget, there are guest houses and budget accommodation to suit your needs. Go for the one that suits your requirement and budget. 4 or 5-star hotel, or a boutique hotel, etc. for a luxurious stay. These hotels offer high-end facilities like pool, bar, restaurant, gym and others. While booking hotels in Mussoorie, look for a locality, which is in a close proximity to the city’s renowned tourist spots. Book a hotel near Mall Road as it is the most happening area. You can also find amazing food points on the Mall Road. This is known as the heart of the city. Taking an accommodation here can be advantageous as there are many good dining places located in this locality. Also, you get to see the awesome view of the Himalayan Range from your hotel room. 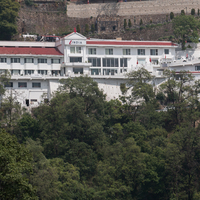 There are nearly 300 hotels in Mussoorie. During the peak season, the prices are high. 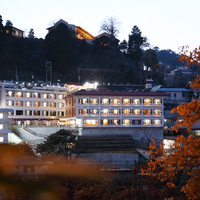 The price of hotels in Mussoorie starts from INR 500 and go up to INR 12-13K, per night. Reaching the beautiful hill station is not difficult as it is well connected to other parts of the country through various means of transportation. The nearest airport is Jolly Grant Airport in Dehradun which is only 54km away from Mussoorie. There are lots of buses that connect the town through road with other big cities of the country. If you want to travel by train, there are many trains, connecting New Delhi and Dehradun. Some of them are Jan Shatabdi Express, the Nizamuddin AC Special, and the Mussoorie Express. , a pilgrimage center, popular among tourists and locals. , enjoy a pool picnic amidst this natural waterfall. , a hill forest village, popular for its serenity and pristine natural beauty. , enjoy the natural beauty while boating in the lake. Do not forget to munch on lip-smacking food here. , the highest point of Mussoorie, which gives a magnificent view of snow-peaked Gangotri, Kedarnath, Nanda Devi, Chaukhamba and Sri Kanta peaks. , the picturesque sanctuary where one can witness rare species of birds. , ride on a horse or walk during the sunset to have a once in a lifetime experience. The city is famous for its culture which is a mixture of heritage art and music and religious shrines. It also shares the culture of the state of Uttarakhand. There are many shopping places in Mussoorie from where you can buy food items, cloths, etc. Some of the popular markets are Tibetan Market, Mall Road Market, Gandhi Chowk, Classic Emporium, Kulri Bazaar, and many more. You can find all the famous cuisines of India here. Some of them are Continental, Chinese, Italian, etc. Also you can enjoy the taste of biryani of Mussoorie. , the capital of Uttarakhand is a charming place and only 35 km away from Mussoorie. It can be a weekend gateway for you. It is one of the best pilgrimages of India which is at a distance of 16km from Mussoorie. It takes only 3hr minutes to reach there. Apart from being a pilgrimage, this place is also popular for enjoying lots of adventure sports. Located at about 77.8 km away from Mussoorie, it is a great place to visit. This is popular for its natural beauty and located at around 316km away from Mussoorie. : This beautiful hill station is about 347km away from Mussoorie. Located about 191km, this hill station is another boon of nature to mankind. Mussoorie experience a sub-tropical climate. Usually, three seasons are vivid in this type of climate- summer, monsoon, and winter. Summer stays from March to June when the average temperature is around 37 degree Celsius. Monsoon is from July to mid-September when landslides are common. Winter temperature is between 30 and 10 degree Celsius. It is summer time and the weather is pleasant. For sightseeing, this is the best season. Winter makes this hill station an awesome place for tourists who want to enjoy the chills. It is at this time when there is rainfall. The chances of landslides are common during this time so tourists avoid visiting the town. - This is a fun-filled festival that is held in Mussoorie every year. It lasts for 10-days and is celebrated with vigour. You can book hotels in Mussoorie during this time to enjoy the festival to the fullest. -It is held every year by the Bhadraraj Temple Trusty on the eve of Shravan Sankranti. - With lots of myths and stories, this fair is organised every year and celebrated with pomp and grandeur. Winters in Mussoorie are quite pleasant. But, one should prefer visiting Mussoorie only after monsoons. The best time to visit the hill station is from September to November when Himalayas are clearly visible. Which are the top 5 must-visit places in Mussoorie? Kempty Falls, Mussoorie Lake, Gun hill, George Everest’s House, and Company Bagh are the top places to visit in Mussoorie. How can I get attractive discounts on hotels in Mussoorie? 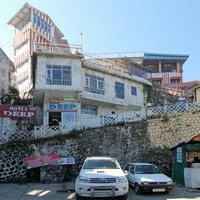 One can go through online websites, such as Cleartrip to avail some attractive discounts on hotels in Mussoorie. However, it is advisable to book hotels in advance and compare it with others to get the best deal. Yes, there are some hotels in Mussoorie that allow unmarried couples to stay but they might check an identity proof while checking-in for further enquiry. How can I find hotels near Mussoorie Lake? 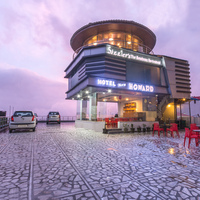 One can easily find hotels near Mussoorie Lake by simply entering Mussoorie Lake in the where field option on the Home Page and book the best as per your requirement and budget. You can enter any landmark as per your choice in order to get better results. Hotels near Mussoorie Lake offer a great view. 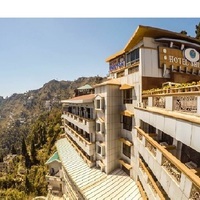 How do I book hotels in Mussoorie near Mall road? You can find plethora of hotels on Cleartrip website by entering. All you need to do is enter Mall road, in the Where filed option on Home Page. Mall road in Mussoorie is a perfect location for those looking for a perfect vacation. 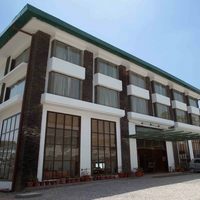 Do Mussoorie hotels offer wheelchair facility? There are several hotels that provide wheelchair facility. It is best to confirm the availability by contacting the hotel before going ahead with the booking. There are many famous things that you can buy from Mussoorie. The most common ones include wooden decorative items, shawls and woollen clothes, Tibetan prayer wheels, handmade jewellery crafts. Can you tell me which are the popular night clubs in Mussoorie? Dickens Bars, Tapas Bar, Woody Barrel, The Victorian Bar, The Tavern Restaurant and Sapphire Lounge and Bar are some of the popualr nightclubs in Mussoorie. It is sure to add more fun to your vacation in Mussoorie. Can you list the top 5 Trekking sites in Mussoorie? The top five trekking sites in Mussoorie are Tap Tibba Peak, Naag Tibba, Dhanaulti, Kanatal and, Har ki Dun valley trek. These treks are sure to give adventure junkies the much-needed adrenaline rush and will take you on a path to self-discovery. What are the famous sightseeing spots in Mussoorie? Adventure Park, Bhadraj Temple, Lambi Dehar Mines, Cloud End and Jawahar Aquarium are some of the famous sightseeing spots in Mussoorie. What are some must do things in Mussoorie? You can enjoy various activities, especially when it comes to adventure, such as rock climbing, paragliding, rappelling, and ATV riding. Nothing gets better than striking a few things to-do in Mussoorie off your bucket list! Suggest a few top party places in Mussoorie? The Victorian bar, Tapas Bar, and Woody Barrel are some of the best restaurants and pubs for partying. They have an amazing ambience set amidst the scenic beauty of Mussoorie. What activities and experiences can I enjoy inWhat activities and experiences can I enjoy in Mussoorie? You can go for adventure sports such as mountain climbing, rappelling or you can dance the night away in various nightclubs. There are numerous other activities in Mussoorie that can be explored during an excursion. 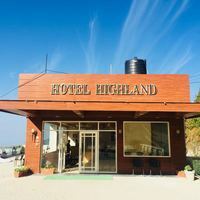 How to book a room for international guests near lake mist, Mussoorie? 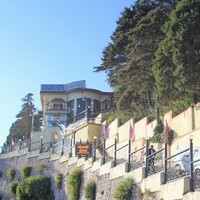 Visit the Mussoorie hotel page on the Cleartrip website and search for the hotels near lake mist, Mussoorie. The best hotels near Gandhi Chowk will be displayed and you can book the one that is suitable for your international guest. From where can I book a good resort for a day outing in Mussoorie? Cleartrip offers a variety of resorts to make a day outing in Mussoorie a perfect one. Spend time with your loved one and go for a Day outing at a resort in Mussoorie . 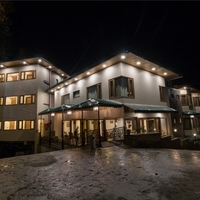 Club Mahindra Kanatal is one such option you can consider. 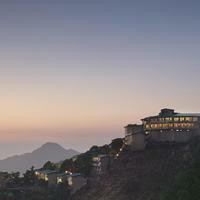 Can you name some 5-star hotels in Mussoorie? 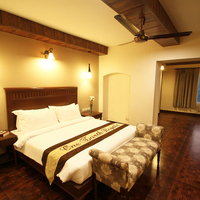 Owing to the growth in terms of tourist footfall, there are many five-star hotels in Mussoorie. Most of them are easily available and can be chosen through Cleartrip. JW Marriott Walnut Grove Resort & Spa and, Jaypee Residency Manor are the most popular five-star hotels in Mussoorie. Can you list some hotels in Mall road, Mussoorie? 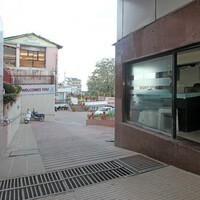 Mall road is an amazing location offering a range of hotels for tourists. The hotels offer all the facilities that a tourist looks for. Amar hotel, Hotel Midway, Bunkotel and Hotel Glenroy are some of the hotels located on Mall road and can easily be found on Cleartrip. Can you name some resorts in Mussoorie? There are many famous resorts in Mussoorie. Simply select resorts in property type on the Cleartrip website and choose the one that suits your budget and requirement. 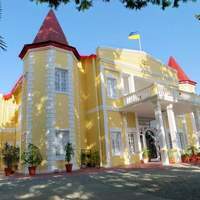 What are the top hotels to stay at Mussoorie? 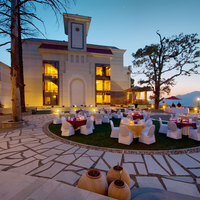 JW Marriott Walnut Grove Resort & Spa, Jaypee Residency Manor, and Welcomhotel The Savoy, Country Inn & Suites by Radisson, Sterling Mussoorie, Hotel Padmini Nivas-A Heritage Property, Hotel Vishnu Palace, Hotel Sun N Snow, and Honeymoon Inn Mussoorie are some of the top hotels to stay in Mussoorie. How far is Mussoorie Lake from Mall road, Mussoorie? Mussoorie Lake is around 7.3km from Mall Road, Mussoorie. It hardly takes 20min to the cover the distance via road. 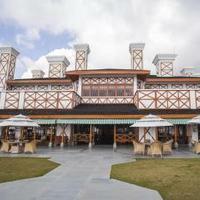 Where can I enjoy best dinner buffets in Mussoorie? 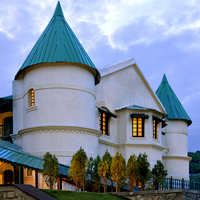 One can go for scrumptious Indian buffet near Kempty Falls to indulge in some finest delicacies in Mussoorie. For more deails, visit the Cleartrip website. What are the top places of interest in Mussoorie? Lal Tibba, Lake Mist, Kempty Falls and, Mall road are the top places of interest in Mussoorie. For an enriching experience, one can also opt for various adventure sports or camping. Can you tell me about some budget hotels in Mussoorie? 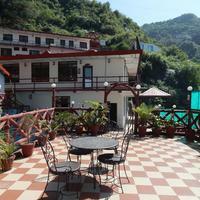 There are various budget hotels in Mussoorie. You can find many of them on the Cleartrip website. All you need to do is just enter your preference in the price filter and it will provide you a list of hotels that suit your budget the best. Depending on your interests, you can make amazing night plans in Mussoorie. You can either camp on the top of a mountain or go to a luxurious pub to dance the night away. Are there any villas near Mussoorie Lake? 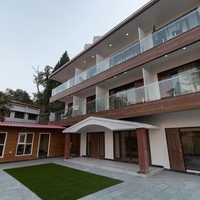 There are many villas near Mussoories Lake, Mussoorie. 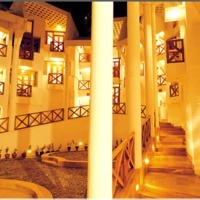 You can easily look for suggestions at Cleartrip.com to find a villa that suits your budget and requirement. Is parking facility available at Mussoorie hotels? Almost every hotel in Mussoorie has parking facility. Some hotels offer valet parking also. While the facility is free-of-cost at most of the places but some may even charge a parking fee. It is best that you confirm the same through Cleartrip before the booking. Do hotels in Mussoorie offer bar facility? Many hotels have a bar facility. However, it is best to contact the hotel to confirm before booking a hotel. Where can I go for weekend getaways from Mussoorie? For weekend getaways, you can go to places like Dehradun, Rishikesh or Haridwar from Mussoorie.